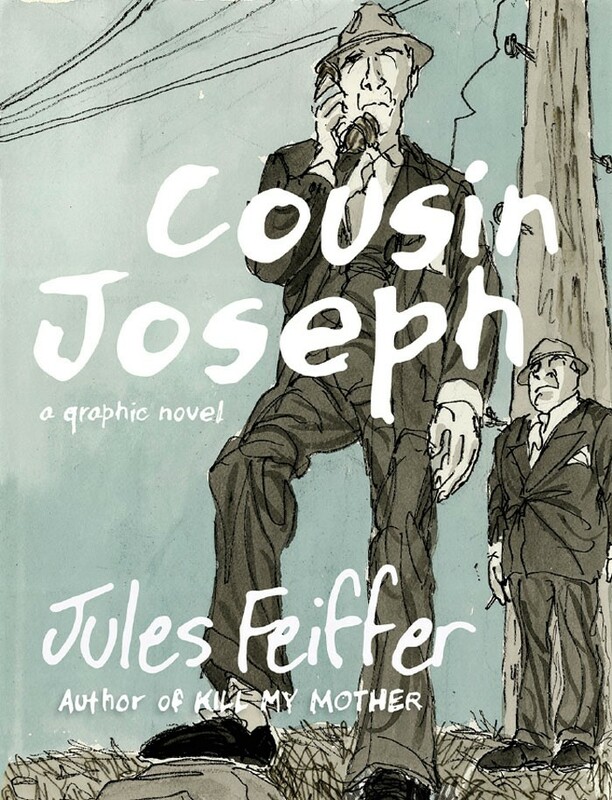 These memoirs will sometimes coincide with other remembrances, so I was reminded that the day I write this, January 26, is the birthday of Jules Feiffer. He was born in 1929. It has been one of the honors of my life to know Jules, to call him a friend, to have worked with him. 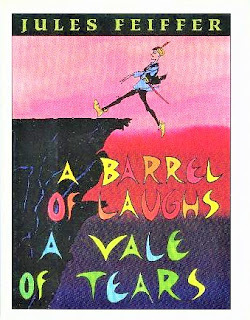 Jules Feiffer has had many careers – succeeding, and successful, activity in even more realms besides cartoons: comic books (The Spirit), strips (his mononymous Feiffer), books (many collections, and original titles like Passionella and Other Stories), children’s books (including A Barrel of Laughs, A Vale of Tears), animation (script for Munro, 1961 Oscar),graphic novels (Kill My Mother and others), illustration (The Phantom Tollbooth), musicals (The Man In the Ceiling), plays (Little Murders), screenplays (Carnal Knowledge and Popeye), novels (such as Harry, The Rat with Women), histories (The Great Comic-Book Heroes), and autobiography (Backing Into Forward). Jules has collected so many awards and honors that he had to move from Manhattan to Shelter Island, just to make room. 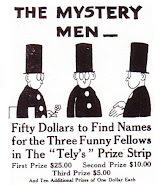 when it went nationwide in syndication. When I was a kid, the only reason I bought The Village Voice was to read Feiffer; just as the original reason I bought The Realist was Jean Shepherd. 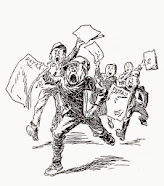 So when I became Comics Editor of Publishers Newspaper Syndicate (previously Hall Syndicate and Field Enterprises and Publishers-Hall; and eventually News America Syndicate and North America Syndicate…) Jules Feiffer was in my stable. Only technically. Like Herblock and a few others, Feiffer was a cartoonist who was distributed by us, but “edited” separately or by others. Milton Caniff’s Steve Canyon carried our copyright, but contrary-wise, was edited and distributed by King Features. 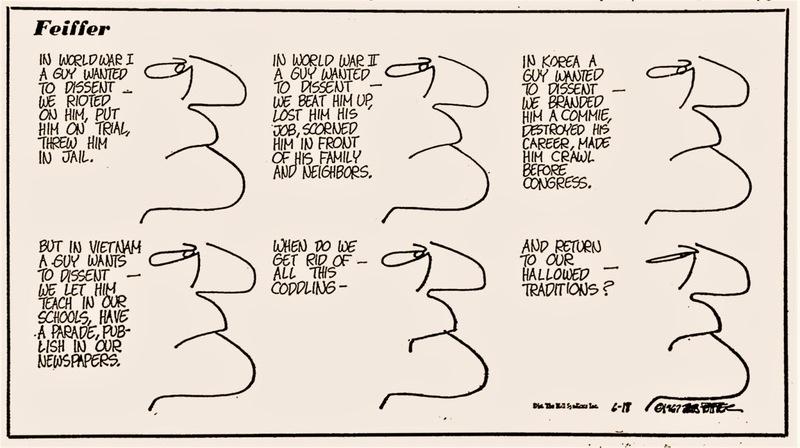 So I never had to edit Feiffer’s work – how could anyone, except maybe spelling errors? – but I sure enjoyed the advance peeks. Since many strips were topical, he worked on a tight deadline, two at a time. As I did with most of the cartoonists while I was at Publisher’s, I established contact and visited them in their lairs. Jules lived in Manhattan, upper West Side, and in my first visit, a look at his walls, where so many other things could and did hang, I discovered that he liked vintage comic strips. I was able sell him some treasures from my collection, and others I found. president’s resignation. Feiffer published two books off Nixon’s corruption and scandals. Not a surprise to anyone who appreciates his output, but Jules is a polymath, interested in almost everything, and the point, modestly but earnestly, of wanting to know everything about everything. 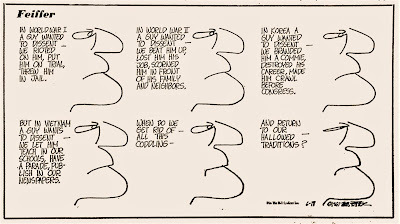 We had other meetings including at meetings of the American Association of Editorial Cartoonists, but the fondest memory is one I have told here in a remembrance of Tony Auth. When I lived outside Philadelphia, Tony called one day and said that Jules was coming to town – actually Cheltenham, the next town to my Abington – to speak at the high school in a special evening program. Cheltenham is a special enclave, its high school lobby’s wall festooned with pictures of notable grads including unlikelies like Benjamin Netanyahu. 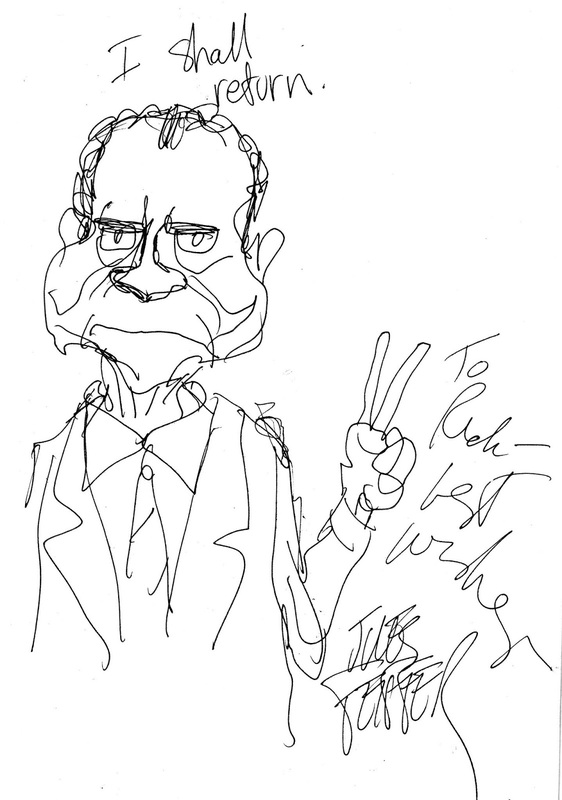 But that night Jules Feiffer would grace the stage. Tony, Pulitzer Prize winner of the Inquirer, was asked by Jules to be his shepherd and guide that day; and Tony in turn asked if they might visit my house, maybe to look at parts of my collection. Well, that turned into a full and fun afternoon – and early dinner prepped by my wife Nancy – digging through piles of originals, stacks of old newspaper comics; runs of political-cartoon magazines like Puck, Judge, Life, and The Masses; and many more of the rare old European magazines of graphic commentary and social protest. Jules loved the classic cartoons. I loved it more when that evening, in the school auditorium, despite his slide show, he made repeated references to things in “Rick’s collection,” with probably two people out of 600 knew who the hell Rick was (and they were Tony Auth and a friend from France who staying with us). Jules is still going strong at 90, the last I checked writing, drawing, and teaching. A great life, and life for us to behold, for a kid from the Bronx who started in the business(es) by offering to work for free with Will Eisner. That’s the spirit! – that’s how much he loved drawing cartoons. After success with Eisner, he first approached the Voice with the same offer – that’s how much he loved drawing cartoons.